Open the fillet tray for 10 minutes beforehand for it to oxidise, cut the vegetables along with the cow’s trotter, which will provide gelatin to the sauce, cook it in the oven until you get a toasted colour and add the white wine. Once the alcohol has evaporated, add flour to it until it is toasted, once toasted take it out and set it to cook with the beef broth, let it cook for 45 minutes and strain it and set it aside. In a lot of very fried oil, fry the arugula, which you then place on some absorbent paper and add salt. Clean the rind and cut 4 pieces as fine as possible, which you then put over a sheet of silpat and cook it at a temperature of 100º for 15 minutes, once dried set it aside for the presentation of the dish. Clean the pumpkin of its skin and seeds, cut it up and boil it with sugar for 20 minutes. Let it drain and put it through the thermomix, keeping it hot. Cut the small venison fillets, add salt and set aside. In a very hot non-stick skillet, add a drop of oil, and then do the fillets just a little, add the juice of the previous cooking to the same pan with the sweet wine, reduce all of this, and keep hot in order to add sauce when passing. 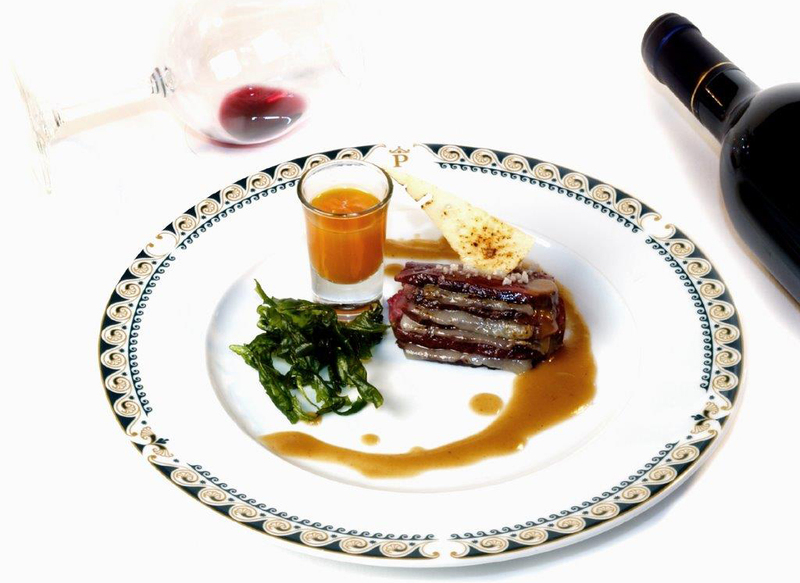 Make a mille-feuille interspersing layers of venison fillets with layers of Zamorano cheese, starting and ending with a venison layer. Once the mille-feuille is made, put it in the oven at a temperature of 180ºC for 3 minutes so that the cheese becomes compressed with the meat. Place the mille-feuilles on every plate while hot. On one side, add a trickle of juice and, on top of the mille-feuilles, place the crunchy cheese on the upper part. Once the arugula is fried and dry, place it on the upper part of the plate accompanying the dish with the pumpkin soup.